"Baby Bink is not a regular baby." Sometimes a movie grabs you. Sometimes it doesn't. It's all subjective, anyway. The prolific John Hughes has been involved with a lot of pseudo classics from the 1980s, as both director and writer, and some work well, some don't. A film like his Planes, Trains And Automobiles is just as damn funny today, but some of Hughes products, like Sixteen Candles and Weird Science, have lost a few steps since those carefree and big-haired days. I never cared for the Hughes-penned Home Alone, or it's inevitable sequels; I just didn't think it was really funny or interesting. The silly and gratuitous slapstick humor, which borrowed heavily from everything from The Three Stooges to the classic Warner Brothers cartoons, just never managed to tickle my funnybone the way I imagine John Hughes intended. I never understood the attraction of Ferris Bueller's Day Off either, but I guess that's my problem. 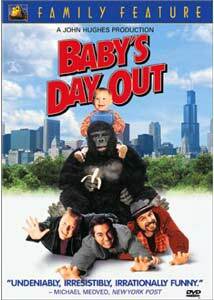 Hughes wrote the script for Baby's Day Out (1994), and its surface similarity to the uninspired antics of Home Alone are hard to ignore; both films feature bumbling crooks, slapstick violence and kids in peril. Despite the commonalities, director Patrick Read Johnson (When Good Ghouls Go Bad) turned what easily could have been a tired retread into a well-crafted comedy that combines impressive Industrial Light And Magic effects with some real laughs. Baby Bink (played by twins Adam and Jacob Worton), the 9-month-old son of the wealthy Cotwell family, is snatched by a trio of bungling baby-nappers and held for a hefty ransom. The kidnappers, Ed (Joe Mantegna), Norby (Joe Pantoliano) and Veeko (Brian Haley), are totally inept (of course), and the baby accidently "escapes" from their clutches and finds himself crawling through the big city alone, constantly on the verge of great danger. With Ed, Norby and Veeko hot on his trail, Baby Bink leads them on a very funny, very goofy chase full of cars, gorillas, fat women, buildings under construction and a highly memorable flaming crotch sequence. Visually, the world of Baby's Day Out plays out like a big storybook, in a cool and hip retro sort of way. Filmed in Chicago, Johnson has cleverly grafted some stylish matte paintings into location shots to give the "city" a completely unique look, and it might surprise a lot of people when they realize just how many effects shots there are. Aside from being one of the first films to digitally remove stunt cables, ILM has littered this film with some landmark composite digital effects shots that still hold up perfectly well today. It's a tough sell to make the kidnapping of a baby funny, but this film seems to meet that challenge pretty well. I suspect it has more to do with the cast, primarily the bad guys, than it does from the Hughes script. Here it falls to the villains, who make the film's base humor work; they're sort of an evil Three Stooges. You get predictably strong comic turns from vets like Mantegna and Pantoliano, but Haley steals this one as the square-headed Veeko. All three are quite funny, even with the obligatory Home Alone-induced scream sequences that have littered just about every comedy since 1990. The cartoony violence, which includes falling off buildings, getting hit with hammers, and being assaulted by gorillas, while not necessarily funny on paper, is sold well by Mantegna, Pantoliano and Haley. Lara Flynn Boyle and Matthew Glave appear briefly as the distraught parents, and seem to only serve to inject some of that typical Hughes syrupy goodness into the mix. As the title character, Adam and Jacob Warton are perfectly cute, but at 9 months old it's tough for a toddler to carry a film. Plus, much of the shots feature either an animatronic dummy or a Rick Baker costume, instead of a real baby. Don't be put off by the title of this one, or the horrible cover art. This is funny stuff. Image Transfer Review: Fox offers a pairs of prints for this release, a 1.85:1 anamorphic widescreen transfer and a 1.33:1 pan-and-scan. Colors are bright, and match that retro-storybook feel that Johnson tried to convey with the film. Detail is excellent, with very little grain, and black levels are solid, with natural shadow depth. Source print flaws are minimal, though some compression issues are apparent. The 1.33:1 pan-and-scan transfer is available on the flipside of the disc. Audio Transfer Review: It's a treat to hear the 5.1 mix on this release of Baby's Day Out. Bruce Broughton's score sounds large and vibrant, and the new 5.1 track really gives a boost the soundfield. Dialogue is mixed well, and plays primarily across the front channels. with a pleasant sense of directional imaging. Rear channels get a bit of workout, most notably during the bus chase scene and the climactic construction site sequences, and show a nice blend of ambient sound cues. Extras Review: The big extra here is a full-length scene-specific commentary from Patrick Read Johnson that is chock full of informative production tidbits. The track focuses mostly on providing insight on how some of the effects shots were done, as well as pointing out the when the onscreen Baby Bink is human, robotic or Verne "Mini-Me" Troyer in a specially-designed Rick Baker outfit. Johnson is a fairly animated speaker, and I found his explanations of how complex some of the effects shots were that it gave me an entirely new appreciation for this film. Plus, he mentions a number of interesting-sounding deleted scenes and outtakes, including one with an exasperated Lara Flynn Boyle making out with the robotic baby, that made wish some of those had found their way onto this disc. No such luck. Still, an enjoyable commentary from Johnson. A 05m:44s featurette is on the lightweight side, and doesn't offer anything of substance. A Baby's Day Out trailer, as well as those for Breaking Away, The Sandlot, My Bodyguard and Rookie Of The Yearare included, along with 20 chapter stops and subtitles in English and Spanish. I missed this film theatrically in 1994, but caught it on video a few years ago while searching for a "family" movie. With visions of Home Alone haunting me, I just wasn't expecting much from Baby's Day Out, and I'll admit I was surprised at how funny it was. Great effects and slapstick humor come together well under the direction of Patrick Read Johnson. This new Fox disc sports a solid 1.85:1 image transfer with an improved 5.1 surround mix that puts the VHS version to shame.